Infrastructure and "Age-Proofing" - What Does Preparing for Aging Mean? As you know, I have a special place in my heart for bringing multiple topics together. Soon after I wrote "Can We Do More Than One Thing at a Time?," the AARP team was contacted by Emily Badger of Atlantic Cities to talk about aging and what that meant for cities. She later wrote an article tying together infrastructure concerns and aging issues, "The Next Big Infrastructure Crisis? 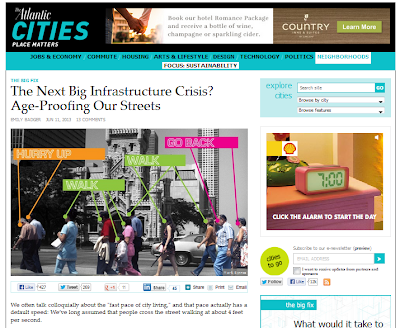 Age-Proofing Our Streets" on the Atlantic Cities site. That piece was the most popular article on their site for a day or two, and at this point, it has about 900 likes, shares and +1s on social media, including a couple from me. I'm quoted in her article: "'Whenever I talk about our policy prescriptions," says Rodney Harrell, a senior policy adviser for housing with the AARP Public Policy Institute, "I say, 'we're going to help you do now what you're going to be forced to do then.' Because you're not going to be able to hide when you've got 20-plus percent of your population over 65. That's a huge portion of the population that's going to come.'" It's important to understand that older adults should be incorporated into planning and policymaking as some forward-thinking communities have already started doing. As I read the comments, I found myself unsurprisingly disappointed at the way that several readers responded - with complaints that "wealthy boomers" can afford to pay for what they need or complaints about the fact that enough baby-boomers aren't agitating for these changes. The mistake that some make is viewing everything only through a political lens - what is this group asking for and what other group will pay for it. As a generation Xer who works in part on aging issues, I don't have the convenience of lining up with one side or the other on any so-called "age battles." I try my best to look objectively at the issues facing American communities over the next few years and decades, and look at the pros and cons for every group. Unfortunately, the failure to invest in our infrastructure seems shortsighted - there is economic development potential today from building it, but more importantly, creating jobs, improving commerce, and easing lives can have economic impacts in the years to come, and the aging population is a factor that should be on every policymaker's mind. We shouldn't be fooled into thinking that all older adults are wealthy or are having their needs met - see this AARP Public Policy Institute report on low-income older adults and the need to incorporate them into "transit-oriented developments." We highlighted the ways that older adults (and others) can benefit, but also highlighted the fact that simply spending money isn't always wise - it needs to be part of a strategic process that takes a broad look at needs, costs and benefits. The people that come to community meetings (on either side of an issue) may not represent the wider population - we should widen our search to capture the broadest possible range of community member's desires. This may mean reaching out through alternative methods to find out the perspective of all groups within the community. Although Emily's piece focused largely on crosswalks, the same goes for all of our housing, transportation,and land use decisions. My suggestion is simple - we should do our best to make our communities work for everyone, and look at the long term, not just the short. What do you think? You can follow me @DrUrbanPolicy on twitter and facebook, and find my work with AARP Public Policy Institute here . I'm happy to continue the conversation below or on social media.